We must remove our head - be willing to completely surrender our physical, emotional, spiritual and mental self to the cause of the Guru. We must have no doubts when we set on this path - we should not care for what the world says. ms514 from Sikhsangat.com says: Sikhism, AMRIT and Salvation: Conside r if you will that Sachkhand is a foreign country. You will need a passport to get in and a visa stamp. AMRIT is that passport and the visa stamp is the Almighty's Kirpa (blessing). In which case Dharam Raaj is immigration. 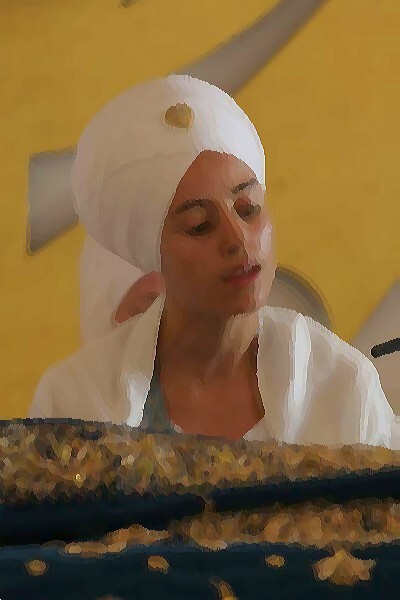 By taking AMRIT, you are going to your Guru and saying that "Your teachings are the best, so I promise to lead the life in the way that you have set for me, with your and Waheguroo's blessings"
Khalsa4ever from Sikhsangat.com says: If you can't take the step to make that kind of promise to your Guru, you won't be able to make it all the way spiritually. mann_kaum_layee_qurbaan from sikhsangat.com says: How many teachers does a person have throughout their education? I have had over 25 to earn a degree. this was just to get a degree in worldy knowledge about one field of study. What is AMRIT? Is it a time to get a sword? AMRIT is a Sikh’s wedding to Guru Sahib. A commitment to keep the Khalsa Rehit. Guru Gobind Singh Ji says that for him Rehit is more dear than a Sikh. You can't give people without Rehit or discipline swords or weapons. One becomes a Saint Soldier or Sant Sipahi after committing to the Rehit so one is truly a Sant Sipahi and not some fanatic with a weapon. Guru Gobind Singh Ji did not take AMRIT to become a Sikh, Guru Sahib took AMRIT to show that the Khalsa was Guru' s Sroop or the Guru's image. Basically like the student is now the master. This is why we say Guru’s Panth Khalsa. 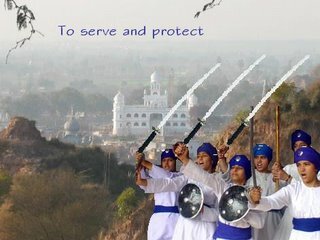 AMRIT is a physical concept to show one's commitment to the Khalsa Rehit or discipline. 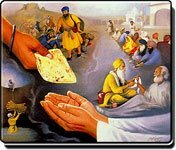 The real AMRIT in Sikhi one strives for is the AMRIT of Naam. This AMRIT was in all the Gurus and also the Bhagats such as Bhagat Ravidas Ji, Bhagat Naam Dev Ji, Skeih Farid Sahib, Bhagat Kabir Ji, and many more. Naam is above all. To say why didn't out Gurus take AMRIT is like saying that the gurus lacked a spiritual Rehit. Reading this article it could be overwhelming. For many taking AMRIT is overwhelming. It is a huge responsibility, and for some it maybe the sole factor as to why they do not take AMRIT. To the western world standards, AMRIT does have restrictions. But the advantages of having AMRIT out number the restrictions in great number. Many of us have to realize that this body we have, does not belong to us. It belongs to the GURU. We have borrowed this body for the purposes of living on this earth. One day, we are going to have to give it back to the GURU. How can we return a body back that has been torn apart by the 5 vices? We can’t. We need to respect our body. And Guru Sahib has given us the tools to do that. 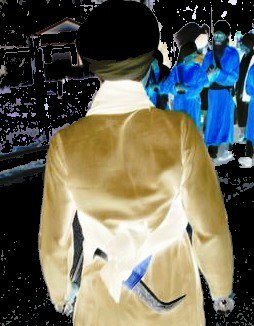 Be part of the ARMY OF GOD – Take AMRIT – you will be glad you did! And their coach is Maayaa. If we want to play we know the rules. We know the risks. But our skates are like ice, and our ice is like the sharp blades of skates. 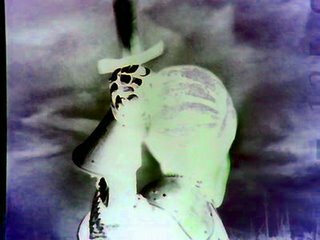 This path is sharper than a sword's edge and thinner than a hair. Article: Hmm... so what DOES AMRIT offer? SaadhRayn Kaur; Sangat Participation: www.Sikhsangat.com; Pictures: From Various Sikh sites on Web. 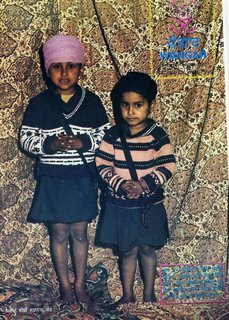 This is a real life story about a brave family that scarficed their lives for the Khalsa Panth: Bhai Mohar Singh of the Damdami Taksal and his wife Bibi Pritam Kaur and their daughters 8 year old Satnam Kaur, 6 year old Vaheguru Kaur. They sacrificed their lives defending Sri Harmandir Sahib in June 1984. 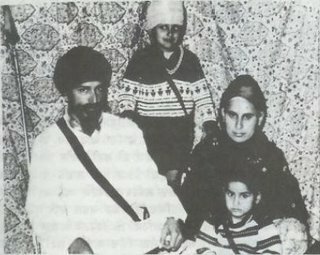 Bhai Sahib’s was no ordinary family they had converted into Sikhi and were regarded as Sant Jarnail Singh Khalsa Bhindranwale’s closest aides. When the army attacked Sri Harmandir Sahib they held their positions until the tanks came into the parakarma (walk way around Sri Harmandir Sahib). "...Bibi Pritam Kaur and her two younger children helped the defence by refilling the ammunition for the guns, and brought in food and water for the defenders..."
On the 6th of June, Bhai Mohar Singh recited his final Ardass to Guru Ji. It has been said, Bhai Mohar Singh, Bibi Pritam Kaur, and their two young children fell onto the army tank near where Shaheed Baba Deep Singh Ji fell. "...Bhai Mohar Singh and his whole family stopped the tank in its tracks and joined the long list of martyrs of 1984..."
After the attack, oppression was leashed on to villagers by state officals, as a result, Bhai Mohar Singh's family became a target of the army. Bhai Mohar Singhs nephews Bhai Bakshish Singh ‘Kalyug’ and Bhai Parmjit Singh ‘Pama’ decided to participate in the freedom struggle that took place post Operation Bluestar. They too took amrit, and as their Unle, Bhai Mohar Singh, they as well joined the the long list of martyrs. Khalsa Ji, today, we bow our heads to this great family who scarficed their lives for our Khalsa Panth. Dhan Dhan Guru Ke Sikh. Bhai Mohar Singh, Bibi Pritam Kaur, Bhenji Satnam Kaur, and Bhenji Vaheguru Kaur will be honoured for their mutual acts of bravery, in essence, for saving the Khalsa Panth. They will be remembered in our ardass eternally. May I recite Guru Ji's Bani? 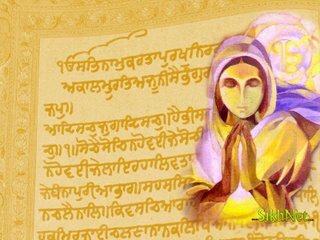 According to Guru Ji’s teaching and Sikhi beliefs, the answer is, yes, Sikh men and Sikh women are allowed to recite Bani from Sri Guru Granth Sahib Ji. 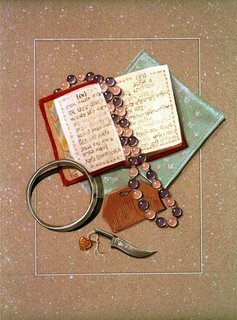 The following article is intended to strengthen the courage of young Sikh women to participate in reciting of Bani within the Gurdwara/Sangat. Bibi Amro ji was the daughter of Sri Guru Angad Dev ji, the Second Guru. She was born in 1532 in the village of Khadur Sahib, District Amritsar. She received her early education and training directly from her parents Sri Guru Angad Dev ji and Mata Khivi ji. Sri Guru Angad spent a lot of time with his children. He taught them the Gurmukhi script that he had revised and simplified which is used in Sri Guru Granth Sahib Ji. When she came of age she was married to Bhai Jasoo on of Manak Chand of Basarke village. Amar Das started to listen to them every day until he was enchanted by them. Bibi Amro told Amar Das about the mission of Sri Guru Nanak Dev Ji and promised to introduce him to her father Sri Guru Angad Dev Ji. Sri Guru Amar Das Ji was so deeply influenced by Sri Guru Angad Dev Ji that he became a devout Sikh, so much that Sri Guru Angad Dev ji announced him as his Successor. "...Thus Sri Guru Amar Das ji, the third Guru got to his destiny of becoming a Guru through Bibi Amro ji..."
Years later when Sri Guru Amar Das ji gave structure to the Sikh Nation and organised his preachers into 22 teaching districts he put Bibi Amro ji in-charge of on of these districts called Manji. What Manji meant was that a person who was leading a Kirtan to be sit on the Manji while whole Sangat in front of Him. The person occupying Manji was the Sikh preacher appointed by Sri Guru Amar Das Ji. This appointment can best be compared to the position of Bishop in the Christian Church today. It was an administrative position, with full responsibility for the equality and content of the preaching’s. She also would have the responsibility of collecting revenues and making decisions for the welfare of her diocese. Her Manji or diocese included Basarke, her husband’s village, where they made their home. It is the direct result of the efforts of Bibi Amro ji and other Sikh preaches that Amritsar today is synonymous with Sikhism. Today, close to the village of Basarke, there is a tank (man made pond) bearing the name Bibi Amro da Talab (Tank of Bibi Amro) in her memory. Fortunately living in the West, many Sikh women do not feel discrimination when attending the Gurdwara or while sitting amongst the Sangat. However, it is vividly clear that in Punjab, India, where Sikhi was born, women are still fighting for their rights to do certain Seva in the Gurdwara. It is the duty of the Daughters of the Khalsa who are living in the West to be ideal examples for Sikh women in India, to follow our footsteps in achieving equal rights. Have you ever thought why Guru Ji, Guru Gobind Singh, gave the name Kaur to Sikhs, more specifically to Sikh women? Why did he not accept the status quo and keep the tradition of the woman's surname being determined by her family's name? What was Guru Ji trying to achieve by calling the Sikh woman "A Prince" (literal meaning of Kaur)? Simmal Tree from DiscoverSikhi.com says: “…it means that the women of the Sikh religion are the true inheritors of the Sikh legacy, and through them the reign of the Sikh kingdom will be established again and again, because they are "princes..."
To try to understand the possible reasons behind Guru Ji's decision, we need to look at the situation at the time in different cultures. In Indian society, the brides first and last name was often changed after her marriage. This still happens today. However, this tradition of name changing does not occur just in India. It is a phenomenon which occurs across the whole world today. Why are women's surnames changed? The reason is family linkage. Surnames allow others to identify you and your family. In some cases the surname can tell others much more about you, such as your caste. For women the linkage to family is different in comparison to men. Their identity changes with marriage. They are no longer associated with their parents, but with their Husband's family. Unsurprisingly, the man's name never changes. Mehtab Singh from DiscoverSikhi.com says: “In those times, women were supposed to be meek and timid, weak and submissive, thanks to the "civilized" Indian culture and society. Dasmesh Pita wanted His daughters to be equal to their male counterparts in all aspects. And so KAUR was made as their surname…"
Some cultures go as far as considering the woman to be the property of others. Psychologically, women have accepted these unjust rules. They have resigned to male dominance and allowed themselves to become second class citizens. Guru Ji changed all this with the revelation of the Khalsa. He gave women the opportunity to live life free of the chains of a dogmatic society. It was God's Hukam (will). Once initiated into the Khalsa, historically, Sikh women obtain the name Kaur and Sikh men obtain the name Singh. However, It is rather interesting to note, that even Male Sikhs in the past have used (and possibly even today use) 'Kaur' in their names, for instance, Akali Kaur Singh, a male Sikh member of the Shiromani Gurudwara Prabhandhak Committee involved in writing of the Code of Conduct and Conventions in 1931 and 1932 used the name Kaur. This difference in names is not about inequality. Rather, Guru Ji recognises the difference between men and women. As individuals we are all different from each other, but this difference does not imply inequality. Women and men are different but remain equals. Guru Ji considered women and men to be unique. He respected the genders and, therefore, made the distinction in respectfully. When you take Amrit you are told to consider Sri Guru Gobind Singh Sahib Ji as your father and Mata Sahib Kaur Ji as your mother. 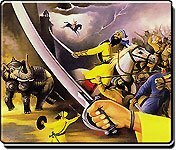 By joining the Khalsa you abandon all previous chains of linkage. You become the direct descendants of Sri Guru Gobind Singh Sahib Ji and Mata Sahib Kaur Ji. You become their daughters. The Khalsa becomes your family. Sahiba from Sikhsangat.com says: “… Whenever I'm filling in an application or anything, and I put down Kaur, I remember I'm Sri Guru Gobind Singh Ji's Daughter. Like, of course we know it, but I never really pay attention to it.....it's not something that I think about all day long. But when I write Kaur, or say it, I remember it instantly. 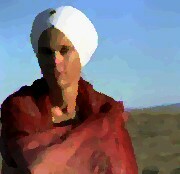 With Kaur, it is my 10th Guru that always comes to mind. It's a really good feeling-Dhan Dhan Sri Guru Gobind Singh Ji..."
Thus, from the day you are born to the day you die your name remains the same. You do not have to change it due to marriage. 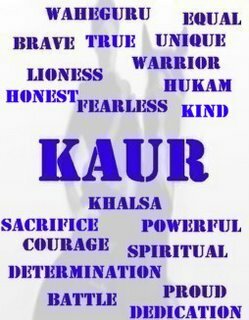 Unfortunately, the tradition of using the "Kaur" as a name has all but disappeared amongst Sikh women. It is either dropped, in favour of caste surnames, or misused as a middle name. Guru Ji never designed it as such. Have we not belittled His concepts? Have we lost so much faith and self-esteem that we must copy the bigoted traditions of others? Sikh women are today demanding equal rights. Rightly so. However, they fail to realise that they themselves create inequality by not considering themselves Guru Ji’s Daughter. They no longer consider themselves as Daughters of the Khalsa. Why should Sikh women feel that they must change their names after marriage? This is not part of the Sikh tradition. It belongs to others. Leave it to them. It has nothing to do with the Sikhism. Waheguru gave us these names. Real freedom can only be found in Sikhi. Real freedom is the freedom ones feels from within, and not the show of freedom we pretend to have in the outside world and to others. By keeping your unique and beautiful Sikh identity you are maintaining the freedom given to you by Guru Ji. Ultimately, by keep and being content with the "Kaur" you truly understand its importance. Others will make excuses about the difficulty of having such a name. Why make such excuses? The importance of "Kaur" is truly inexpressible. It is something very unique in the history of the world.